Do you want to hazard a guess at what yarn she used? Handmaiden’s Sea Silk (in “Straw”), held double, making this the most delectable Wisteria on the planet (unless, maybe someone’s made one out of cashmere…). Just… wow! I didn’t get to see it in person (see the intro paragraph), but Lindsay and Kristin couldn’t stopped sighing over it when they told me about it later. 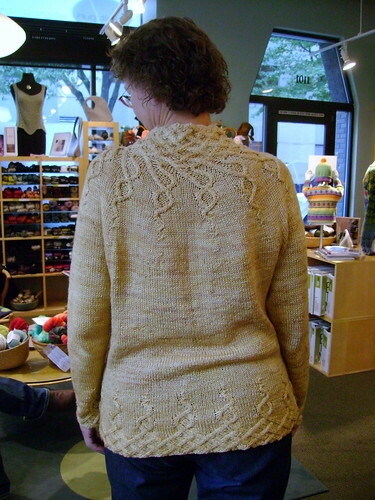 Alas, I couldn’t find Susan’s project on ravelry, so we’ll just have to love it from afar. 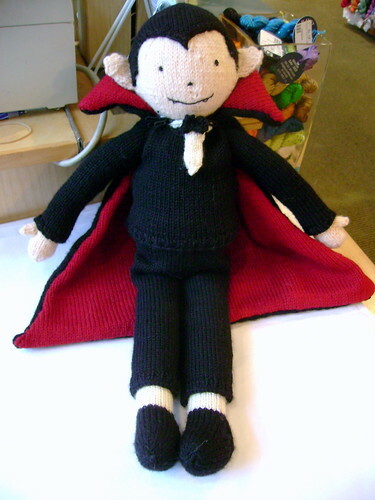 Next, we have a vampire that’s cuter than Edward Cullen (sorry, couldn’t resist), because Sandy Kay has finished Victor the Vampire! And he’s on display in our side window. The next time you drop by the store, be sure to check out the creepy/ cute Halloween display we’ve set up. I’ll take a picture of the finished display (we’re missing a pumpkin and some handknit bats), and post it in next week’s post for all of our lovely out-of-town blogfans. 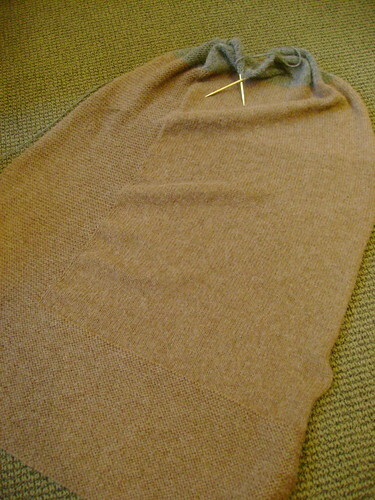 That she’s making with Joseph Galler Prime Alpaca. It’s soooo soft, you (okay, we) just want to roll in it. Mmm, alpaca. First and foremost, we still have a couple of spots left in our upcoming Mad Hatters workshop. If you’ve ever been interested in learning to knit colorwork or design your own colorwork projects, this is the class for you! 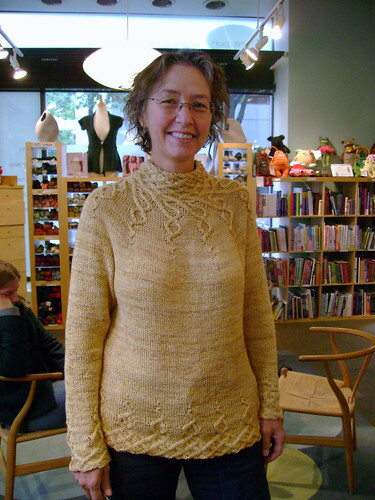 Second, did you know that Julie Weisenberger of CoCo Knits is coming to Knit Purl?? It’s true, she is! And she’s going to be teaching three awesome classes: What Not To Knit, Finishing/ Design Techniques, and CoCo Knits Cornucopia. If you’re a CoCo Knits fan be sure to register early (this news is going out in the Newsletter tomorrow! ), because we expect these classes to fill up fast. Last, but not least, be sure to check back tomorrow for another installment of Gratis Knits! Yes, that’s right, we’re bringing back our popular quarterly free pattern series. But, until then, keep knitting! The post And we’re back! appeared first on Knit Purl Blog.